Last fall, a cucumber-shaped visitor zoomed through the inner solar system. Known as 1I/2017 U1 'Oumuamua, the unusual object sped around the sun before disappearing to the outskirts of the solar system, on its way back to interstellar space. But new research reveals that it wasn't smooth sailing for the interstellar interloper. Instead, it looks like 'Oumuamua didn't glide through the solar system but rather tumbled willy-nilly, flipping as it journeyed on. Working with several other researchers, Fraser examined observations made by astronomers around the world to conclude that the object is tumbling through space. Fraser thinks it's likely that a collision sent the rock tumbling while it still orbited its parent star, before gravitational interaction with a planet flung the object out of its natal system. "I think 'Oumuamua was first sent tumbling and then punted out of its home," Fraser said. 'Oumuamua first caught astronomers' eyes on Oct. 19, 2017. Calculations revealed that the unusual object was moving at about 85,700 mph (137,900 km/h) relative to the sun — a speed that meant it was just passing through the solar system and not remaining a permanent member. Telescopes around the world turned to the object, trying to collect as much information as possible before it left the solar system forever. The interstellar asteroid was named 'Oumuamua, Hawaiian for "a messenger from afar arriving first." Some characteristics were easy to pin down. Scientists determined that the rocky object is about 1,300 feet (400 meters) long, and quite thin — perhaps just 130 feet (40 m) wide. It showed no sign of any activity suggestive of ice, like a comet might display, but instead looked to be made of solid rock. Its surface was reddened by cosmic rays over hundreds of millions of years, most likely as it traveled through interstellar space. But not everything was so easy to determine. Astronomers were having a hard time figuring out how the object rotated. As more and more papers were published on the topic, each estimated a different rotational period. "Normally in a situation like this, as more data becomes available, the published rotation periods get more refined, and the values begin to converge on the correct value," Fraser said. "So it was surprising to see this wasn't the case with 1l ['Oumuamua]." "It seemed no one could agree … and the more data added, the worse the discrepancies got," Fraser said. He decided to pull all of the information gathered by astronomers around the world into a single coherent set, and measure the rotation period for himself. "The results were weird," he said. Normally, when a rocky body such as an asteroid rotates, it produces a regular pattern of brightness variations that astronomers measure. That's because the object continues to show the same face to the observer. But this wasn't the case for 'Oumuamua; the brightness variations were unpredictable, Fraser said. Similar measurements can come from active comets, he said. Dust and gas around comets can obscure their light, creating a variable signature. But 'Oumuamua showed no sign of comet-like activity. "The only other option we could come up with was [that it was] tumbling," Fraser said. Study co-author Petr Pravec, an astronomer at the Academy of Sciences of the Czech Republic, modeled the data and quickly found a tumbling model that worked. "Voilà! We had our answer," Fraser said. "We knew it must be true, but Petr really showed that our expectation did match reality." The research was published online earlier this month in the journal Nature Astronomy. Initially, Fraser thought the asteroid appeared different to each observer because it was actually changing. He thought perhaps radiation from the sun could be baking the surface, darkening it in real time. "Turns out, that thought was wrong!" he said. When Fraser looked at all of the data, he realized that it wasn't progressively growing darker. Instead, the measurements were mostly neutral, "reflecting like most rocks and dirty snow reflect," he said. He realized that the reddish measurement instead corresponded with a single patch on one of the long faces. But the changing colors aren't ones you and I would see. "The differences in surface color are very small and wouldn't be picked up by the human eye," astronomer Meabh Hyland told Space.com. Hyland and Thomas Seccull, researchers at Queen's University Belfast, were co-authors of the color-spectra papers on which Fraser's team based their tumbling conclusion. Instead, 'Oumuamua's red spot would look much like the rest of the object's surface. If the interstellar visitor is predominantly icy, with an irradiated crust, such dampening would occur fairly quickly, over the course of about 1 billion to 5 billion years, Fraser said. (For comparison, the solar system is about 4.6 billion years old.) If, instead, 'Oumuamua is made mostly of rock, it could take hundreds of billions of years to come to a stop. "Needless to say, it will be tumbling for some time yet!" Fraser said. There are a variety of ways for an object like 'Oumuamua to pick up a random whirl, he said. Passing too close to a planet or star could cause a gravitational tug that could make it start spinning. Cometary actions and torques from radiation forces could also play a role. While Fraser stressed that astronomers can't be certain how the tumbling actually started, he suspects that a collision with another object was responsible. A powerful crash would be unlikely in the vast emptiness of interstellar space, he said. 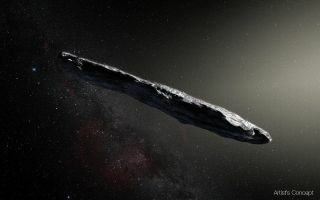 It's more likely that 'Oumuamua picked up its twist while passing through a populated zone like our own solar system's asteroid belt or Kuiper Belt. Later, interaction with a giant planet most likely hurled it from the system, much as a young Jupiter cast early debris from our solar system. 'Oumuamua should pass Jupiter's orbit in May 2018, travel beyond Saturn's orbit in 2019 and then head out of the solar system. That means astronomers won't get another glimpse of the unusual object. "The frustrating and equally romantic part of this whole thing is, we now have a pretty good picture of what this object looks like and how it wobbled around as it passed through," Fraser said. "But it has left a number of outstanding questions, such as where it came from or why it started tumbling, that we will never be able to answer, because we will never be able to see it again." 'Oumuamua "was the first object that brought space to us, and how fleeting a glimpse it provided," he said. Follow Nola Taylor Redd at @NolaTRedd, Facebook, or Google+. Follow us @Spacedotcom, Facebook or Google+. Originally published on Space.com.